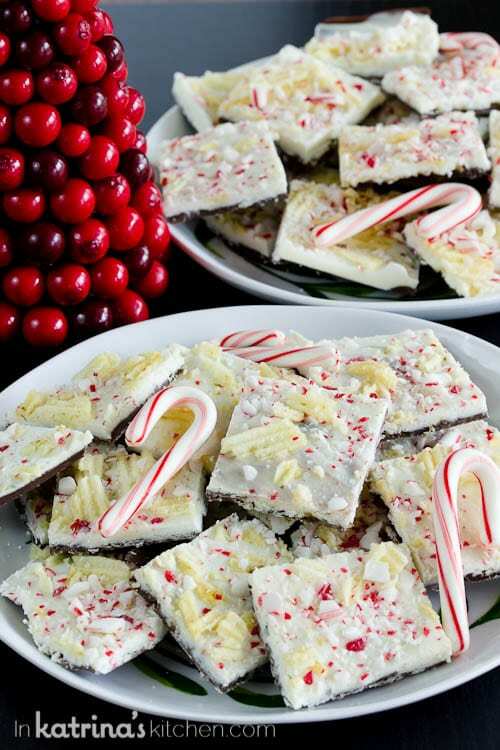 Switch things up this holiday season with sweet and salty Potato Chip Peppermint Bark -crunchy potato chips and candy cane pieces nestled between creamy layers of dark and white chocolate. Are you down for sweet and salty desserts? In my 20’s I would have said you were crazy. If I’m having dessert I’m having it sweet with extra sugar on top. A dash of coffee with my cream and sugar, please. Corner piece of the birthday cake, please! But now that I’ve reached the ripe old age of 30ish going on 40ish my tastes have changed and I find myself gravitating toward sweet snacks with a salty twist. I know this is an age thing because my husband and I were able to eat this whole pan of Potato Chip Peppermint Bark without our little guys snatching it out of our hands. We’re also giving it as school teacher and staff holiday gifts this year as well! Last year we gave Sugar Cookie Dough Cups. I love giving and receiving handmade gifts! 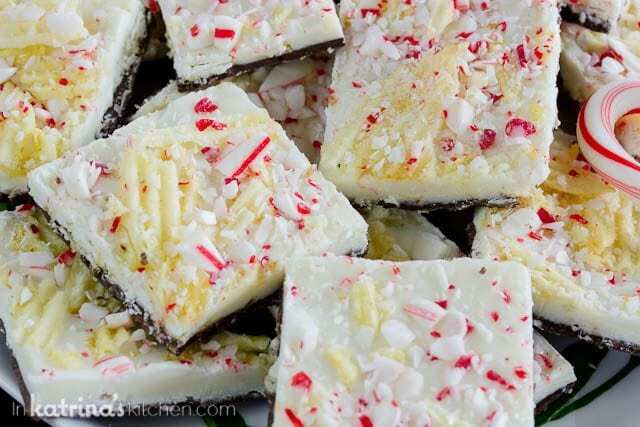 I know you’re going to love this sweet and salty Potato Chip Peppermint Bark! Check out the quick video below to see how quickly this comes together. Merry Christmas if I don’t get to talk to you before the holidays! 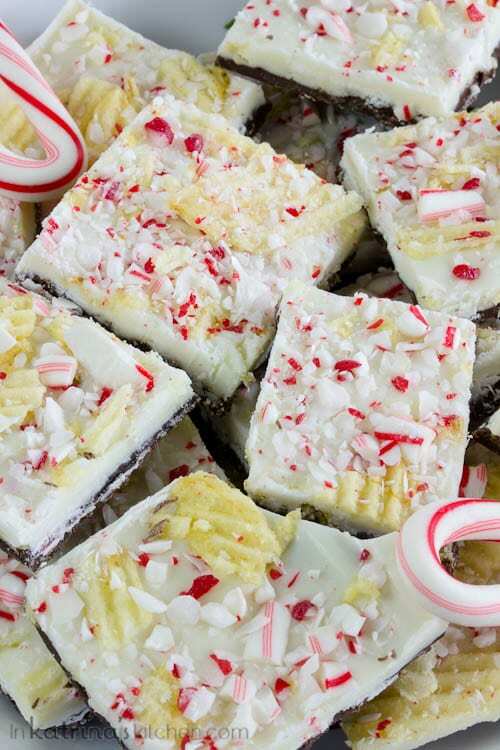 Potato Chip Peppermint Bark -crunchy potato chips and candy cane pieces nestled between creamy layers of dark and white chocolate. Melt the dark chocolate according to package directions until smooth. Stir in 1/2 teaspoon of peppermint extract. Pour chocolate over lined baking sheet and smooth out to desired thickness. Immediately crush 1 cup of potato chips over the dark chocolate. Set to chill in the refrigerator for 15 minutes. Melt the white chocolate according to package directions until smooth. Stir in 1/2 teaspoon of peppermint extract. Pour white chocolate over the dark chocolate and potato chip layer. Smooth out to desired thickness. 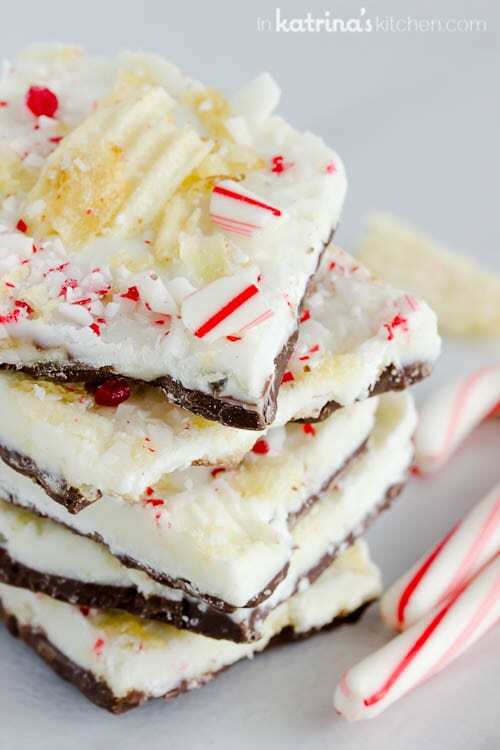 Immediately crush 1 cup of potato chips and candy canes over the white chocolate layer. Set to chill in the refrigerator for 15 minutes. Break into pieces by hand. May carefully use a knife or metal spatula if desired.